My friend did go back, paid the shop owner cost for the deer head, and hauled it home. Where it sat in the bag for several weeks. I eventually got a text from my friend asking me if I was still interested in purchasing the deer head. I told her to bring it over – I’d take a look. Upon seeing it I whipped out my checkbook and promptly paid her! I didn’t want her to change her mind!! 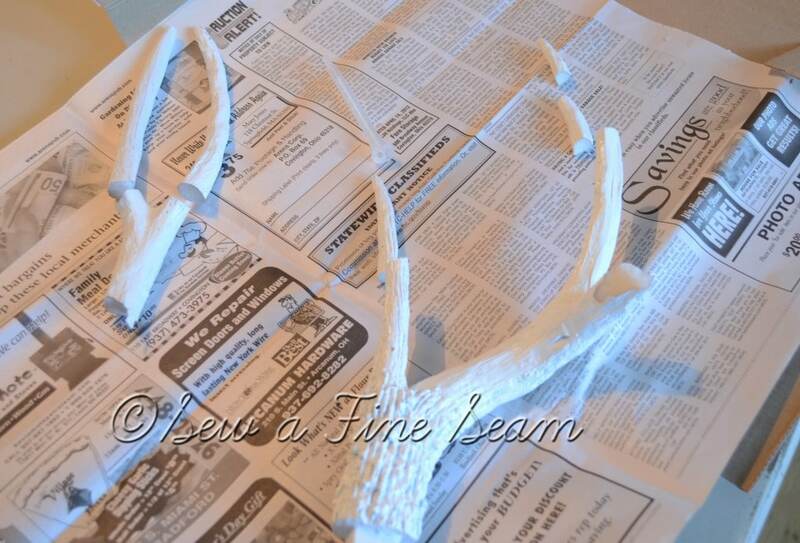 The right antler looked like this. But don’t you see the potential?? Even with a broken antler he’s a beauty! AND he’s WHITE!!! Seven pieces. A tube of epoxy. Help from my hubby. We figured out how it all went back together and started gluing. When using epoxy you have to work quickly and it’s pretty much a one use substance. Once the stuff in those 2 separate tubes mixes it immediately starts to harden. If you put the tube down for about 3 seconds you will no longer be able to get anything out of it. The next night we finished it up. Less than a week after I got him he was once again proudly displaying a full rack! The fact that there are some fine lines in several places on one side of the rack just adds some character. Are you a fan of deer heads on the wall? Or would you prefer they find a home somewhere besides yours?! Don’t think I’ve ever desired a deer head for my walls. Yours looks great though. And my husband did hunt the first few years we were married. He even has a couple of racks-no heads-just the racks. He recently got them out of our old house and my son claimed them for his bedroom walls. Racks are cool too! Pull those things out and make a fun tablescape for fall – I’m SURE your hubby would be SO impressed!! He’d probably tell you to quit talking to your sister! A deer head is something I’ve never even thought of wanting, but,as usual, you’ve made it look very good in your house. Good job with the epoxy! 🙂 Thanks Mom! I promise not to try convincing you to put a deer head on your wall! LOL!! I don’t much care for real deer heads. I think they are sort of spooky…but yours I love. 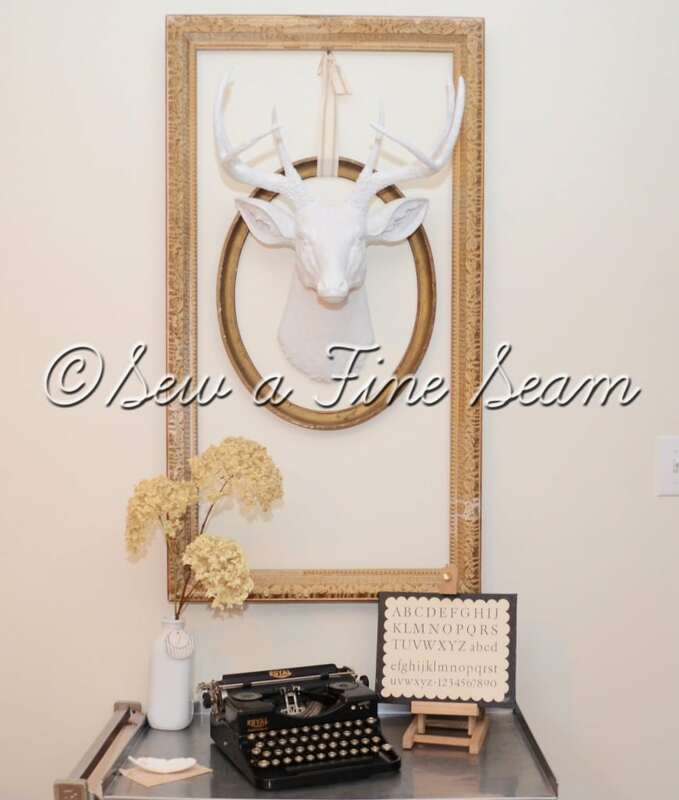 Who wouldn’t love a white deer head surrounded by vintage frames? Perfectly displayed. Enjoy! Thanks Ann! I think your opinion on real deer heads is shared by many!!! But I have this vision – I think you would be pleasantly surprised!!! I would NOT want a deer head on my wall but your all white one isn’t too shabby! And if you hadn’t pointed out the broken antler (although now I do remember the story of J and her “accident”) I wouldn’t have noticed it at all! It really doesn’t show up much at all! I’m happy with it! oh, ack! i mean, he looks beautiful the way you have him displayed and everything – but he’s NOT real right?? uuugh. i really don’t like heads on the walls. . . I am ABSOLUTELY DROOLING over that big rectangular frame (and the oval one, too!). I love everything else in the photo too. Still coveting that little alphabet card. . . talk to you soon! 🙂 You and a lot of other people don’t like the real ones, Breida! But I have a vision – and I think you would be pleasantly surprised at how much you actually liked my REAL deer head on my wall if I had one! LOL!! Not that you would want it on YOUR wall but it might change your opinion of deer heads on the wall just a smidge!! brilliance! I love it all…the story, the deer and the display! 🙂 thanks Peggy! I will get over to share later today! I have several link ups I do on tuesday and yours is one of them! Thanks for the sweet comment! Call me a liberal, but I prefer a deer’s head on its body. However, faux is fine. 🙂 No problem Mimi – we are all entitled to our own opinion! Have a blessed day! White and beautiful. I think your faux deer head looks quite lovely. He looks great Jill. Love your vignette. I would love to help you out Kellie – are within driving distance??!! Hmmm – that is doable! Do I know you in real life? I keep wondering that but can’t decide!!! No, we have never met in real life. I did contact you through your etsy store a few weeks ago. I simply cannot imagine our deer head on the living room wall, although dearhubby has always wanted it out here. Would love to see what you’d do decoratively with a real one. The white one is perfect! My grandfather had a hand-carved one in walnut that (I think…) his father carved and I always wanted it. It was very detailed with even the fur carved in. It was life-sized, but I have no idea where it ended up…. A very fine specimen and with your typewriter and the frames and all it’s so cool! I can’t imagine wanting a real one after having one like that. You did a great job seeing the potential in the broken pieces. Bravo! Thanks Liz! I’m liking him pretty well! Might not even ask hubby if he’s going hunting this fall! I’m digging it! Love the frame around it. Thanks Kay Ann! The frames were already there – he fit in so nicely! 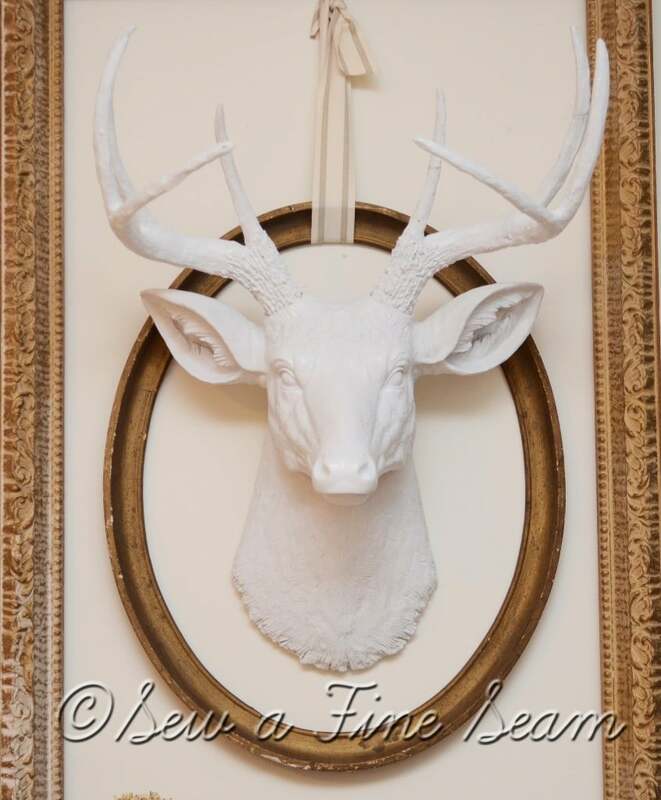 What a fabulous deer head on your wall! I love it! Fabulous fix, character and all! Thank you Linda! Epoxy isn’t my favorite thing to use that’s for sure! It definitely has a mind (and smell) of its own! EEEeeeeeek! I LOVE HIM!!! I KNEW I would be so envious when I saw it up on your wall! Eldon says He LOVES him just where he’s at, haha. He wasn’t sold on my vision, but I’m SO glad someone has him who IS 😀 It looks awesome just like I knew it would! I have to say, I still can’t go in that store without being scared to death that I’m going to break something, lol 🙂 Anyway, you did an awesome job with it. I seriously, seriously love it. 🙂 Well, you can tell Eldon ‘thank you’ from me I guess! If he had loved it this deer would be on your wall instead of mine!! I do like him an awful lot! You know who to call next time you break something – LOL!!! Your deer head looks great! I hope you one day get the “real deal” because I am so curious of your vision!! Thank you Toni! I have a crown I would try out on my real deer. And some other ideas! It would be fun I think and I think most of the skeptics would be pleasantly surprised! Jill!! I’m sooooo GLAD you took him!! He’s absolutely WONDERFUL!!! So glad you got to fix his antler!! Thanks Christine – he is pretty great isn’t he! I’m so happy it worked out that he is on MY wall! Thank you Kara! 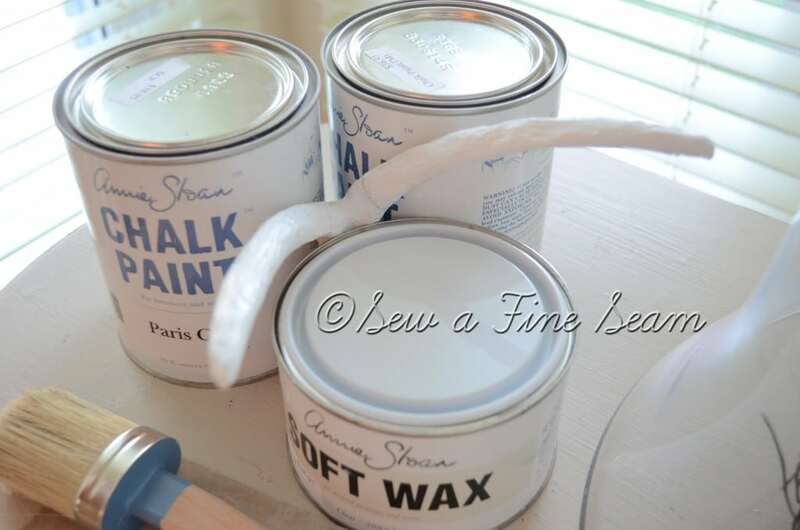 It does seem like something you would use in a decor project! I’ve seen some since I got mine that were gold – that makes me think of you too! Thanks so much for coming by and commenting! I love your blog and it makes my day when you have time to come by mine! What a misfortunate event that turned out to benefit you! It’s a great piece, and looks wonderful where you put it! 🙂 Most people think I’m crazy wanting a deer head. So far most people are pretty impressed with this guy – even if they don’t want him on their own wall. I really should give him a fun name. Maybe I should have a ‘name my deer’ contest! I love them. I’m like you, I never mind a few character-building dents and dings, as long as the price is right! Thank you Jennifer! I agree, character on decor pieces is great! Looks great, have been loving the faux mounted animal look lately! Hopping over from Happy Hour at Craftberry Bush. Thank you Kelly! It’s been a fun addition to my living room 🙂 Thanks so much for stopping by and taking the time to comment! God bless your weekend. I love your deer and he’s all the more wonderful since he was a rescue deer, looks great! I find myself here again just swooning over your projects. 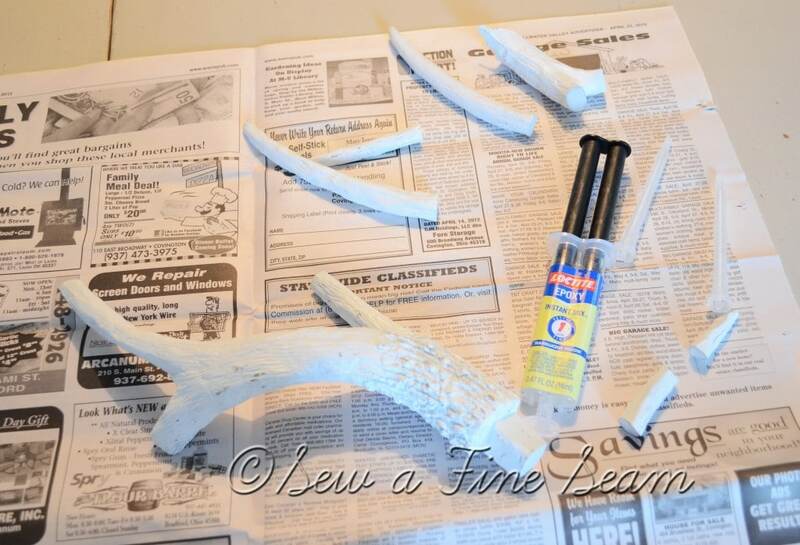 I too, have ALWAYS wanted a white deer head on my wall! I painted a silhouette of one this year, but it just isn’t the same. I love how you took the plunge and put this little deer back together because you rocked it. It looks flawless and worth the elbow grease. It is stunning, the whole display is perfect. Thank you so much for sharing! Thanks Taryn! You are so sweet! I finally followed you this week – not sure how I managed to miss that the first few weeks but now I will get all your posts in my inbox! This is just so so adorable! I love how you used two frames instead of one. It has so much more dimension and interest! 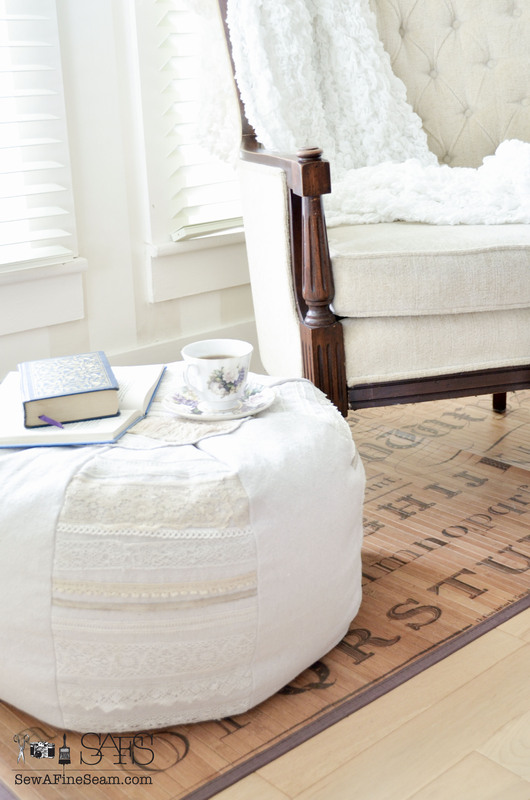 This is so lovely, I will definitely be replicating this for one of my projects! Thanks for the inspiration Jill! Thank you Sarah! Glad you liked it – I want to see your project using this as inspiration! Here for the first time! All the vintage loveliness on your wall makes me want to look around and stay a while!! Thanks for the inspiration. Thank you Bethany! So happy you took the time to comment – it’s always fun to see who stops by! This is fabulous!! Great recovery and rescue operation. Well worth the trouble! Thank you for joining Home Sweet Home! Thank you Sherry! Thanks for always coming over and commenting on my link ups! I know that takes a ton of time and just want you to know I notice and I appreciate it a lot! Wow, this looks great. I have a set of racks on my wall…I have a son that is an avid deer hunter but won’t even give me a set of antlers. So I bought mine at a local antique store. You did a great job at saving this piece and the way you put it together looks fantastic. Thank you Terry! That is so not fair that your son won’t share! LOL!! If my hubby ever gets out there and hunts again I will be fighting my middle daughter for the hide, rack/head mount! She is determined she will have a deer hide someday! Hi, I absolutely LOVE your deer head! 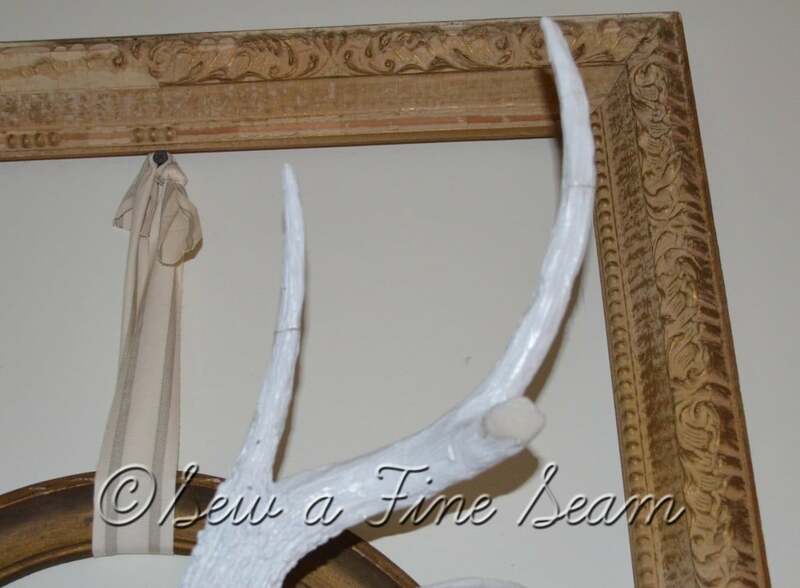 A few months ago, I went on Etsy, and found a extremely similar one, that has the antler’s detached as well (that’s how they ship it) and have been eyeing it since…in white as well…for my master bedroom. I asked hubby how he would feel about it, well, he said it would freak him out, but now, seeing it on your wall, I just may pull the trigger. 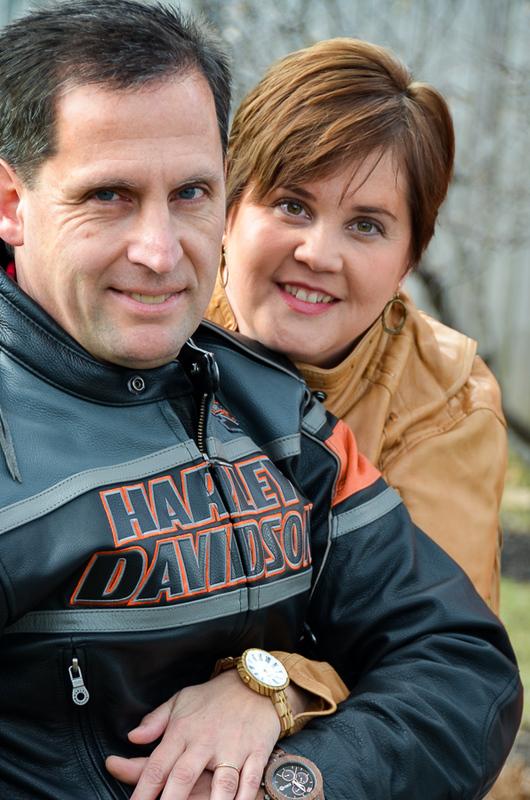 Thanks Kristel – I love him too! It was so fun to have him this year and deck him out for the holidays! I think you should get one – your hubby will end up loving it! Love your deer head. Don’t blame you at all for keeping it and fixing it up. I would have too. Just found your blog and will have to look back at everything. Love it!